A side panel meeting was organized by IHRC in Geneva at the United Nations on the situation in Egypt: From revolution to Military Coup in Egypt that charted the journey from optimism to disappointment, from a democratically elected government to a military coup, two years later. The military coup took the revolution into a wrong direction with the situation turning bad to worse with 4000 dead, many missing, and many in prison in the post-coup period since July this year. Mr. Mohammed Ghanam who is part of Muslim Brotherhood was the first speaker. He gave a historical background drawing parallels between the 1952 revolution followed by the 1954 Nasser led coup with the events of 2011 revolution and 2013 coup. He explained how the Muslim Brotherhood was one of the few organized political movements against the military from 1952-2011 and again in 2013. Due to its stance against the military it suffered a lot of persecution. Mr Ghanem went on to say that the Military had some economic interests monopolized the economic and political system in Egypt, which violated democratic values. He explained how the democratically elected Muslim Brotherhood government was not allowed to function, and purposely made to fail. An organized counter revolution took place using the media, economic resources, police, army and demonstrations to topple the Muslims Brotherhood government and install the army. In 2013 the defence minister/army chief gave an ultimatum, President Morsi was removed from power, abducted and kept in an undisclosed location. Millions of people came out at Rabba and Nadda Square in favor of Morsi. People were insisting on the reversal of the coup, and asked the international community to support Egypt to promote human rights values and dignity. The Judiciary came under the control of the army and banned the Muslim Brotherhood in September 2013. The next speaker was Magdy Hussaini. 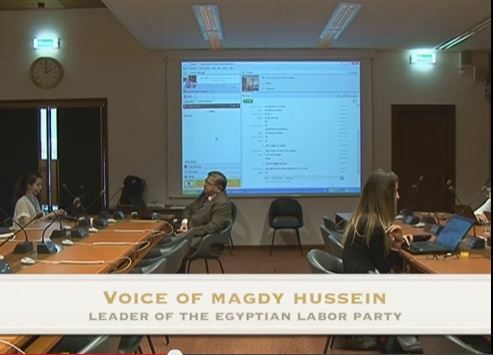 He is the leader of the Labor Party in Egypt and we got another perspective on what was happening in Egypt. He quoted very gruesome statistics on the atrocities committed by the authorities after the coup. 5000 killed, 120 women and children killed, 9000 injured. 12,000 people have been arrested, 1200 of them women and girls, 140 children as young as 7 years and 8 years old. Mr. Hussaini criticized the military for kidnapping President Morsi, cancelling the constitution and attacking all kinds of liberties. He describes the current military regime as much worse than President Mubarak’s reign. Salma Ashraf, the third speaker is a human rights activist who witnessed what happened at al-Nahda Square and Rabaa al-Adawiya Mosque. She witnessed heavy and continuous shooting with sniper fire, bulldozers destroying houses, electricity being cut off, tear gas was used and tanks were deployed. Shooting and tear gas were used even inside the hospital. People’s bodies were burnt after being killed. During the question answer session, Salma talked about how unarmed civilians will continue the struggle until the coup is over, and the military back in their barracks and democracy is returned. At the end of Salma Ashraf’s intervention, the Chair of IHRC, Mr. Shadjareh thanked Salma and appreciated her contribution. Mohammed Ghanem was asked, what next for the Muslim Brotherhood? Is Islam a political system or spiritual system? Was it not the biggest mistake of not compromising with other groups? His reply was, we will not accept suppression, injustice and we are against the coup. Goodness is with the majority. The priority is to ease suffering, do as much as possible to comfort people, carry on with political engagement and continue demonstrations against the coup. “We have faith, we will challenge. We are humans, Muslim, and pro-democratic. We are democratic,” he said. On whether Islam is a political system or a spiritual system, he replied Islam organises human activity and it includes political activity. Every human activity has political, economic, social and justice dimensions. He added that the 2011 revolution was a shared revolution and the Muslim Brotherhood was elected, this was not an excuse for having military coup. It is beyond human morality and ethics. Massoud Shadjareh then talked about how we had to raise the issue of the Egyptian coup and its aftermath at every level. Those of who us who are outside need to raise the issue with the international community. He added he was disappointed by what the international community has done so far, with some countries like the United States and others have not even recognized that what has happened in Egypt is a coup. Other questions were raised, but the last question by an Iranian journalist was what was the difference between Muslim Brotherhood in Egypt and the Islamic revolution in Iran, what is Muslim Brotherhood doing for coexistence in Egypt? Mr. Massoud Shadjareh replied that while the whole political, economic, judicial and social structures changed in Iran after the revolution. The Muslim Brotherhood left everything intact including the military and judiciary. It was a weakness but also a difference in approach. There were no immediate huge changes in relation with the West and Israel. The Muslim Brotherhood was very sensitive on how they were interpreted, thus leaving the judiciary and military intact, which in turn probably what lead to the military coup. He concluded by saying that the military Coup was against the masses.